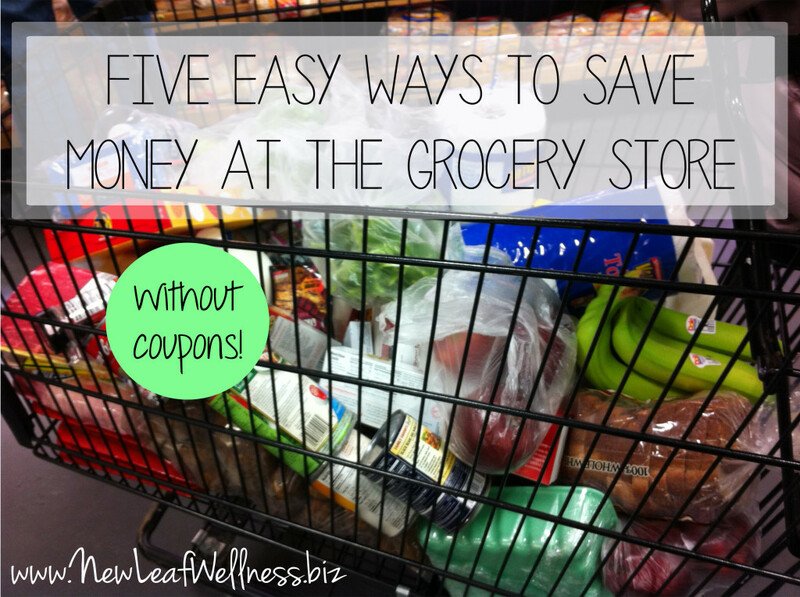 Here are five easy ways to save money at the grocery store – no coupons required! While coupons are not my forte, I’m fantastic at budgeting and managing our family’s finances. Friends ask me all the time how I cook six nights a week on a budget, so I’m sharing my five best tips for saving money at the grocery store below. You may not get the same “wow” factor of seeing savings deducted from your receipt like you do with coupons, but the savings definitely add up over time. I promise these tips are so simple that anyone can use them to save money. If I can do this, you can too! You can start saving money by buying household items like shampoo, toilet paper, and soap in large quantities and storing them in your basement or garage. 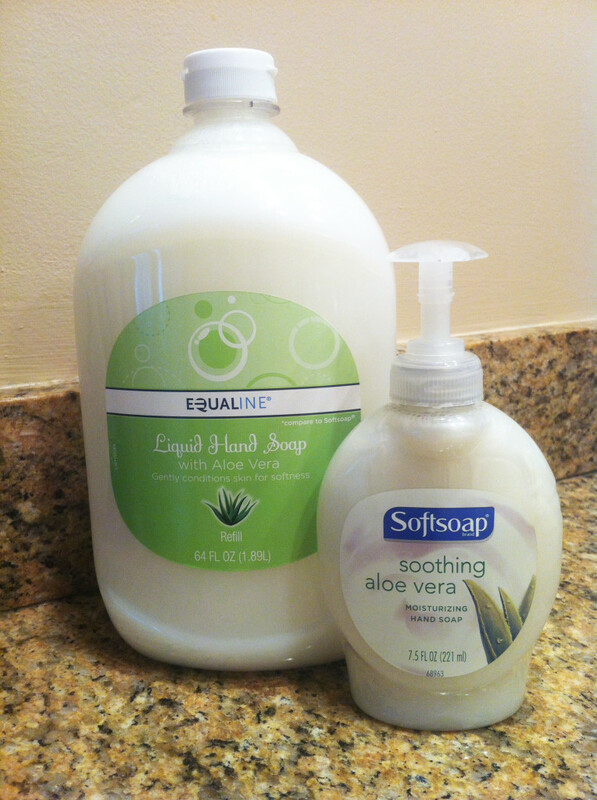 One of my favorite items to buy in bulk is liquid hand soap. At my local grocery store, a 7.5 fl oz pump of name brand soap costs $2.29. In contrast, a 64oz refill of generic hand soap costs $3.99. By the time you use the entire refill, you’ll have saved about $15.50! Simply re-fill the disposable pumps that you have or invest in decorative ones. No one will even know that you’re saving money and buying generic. 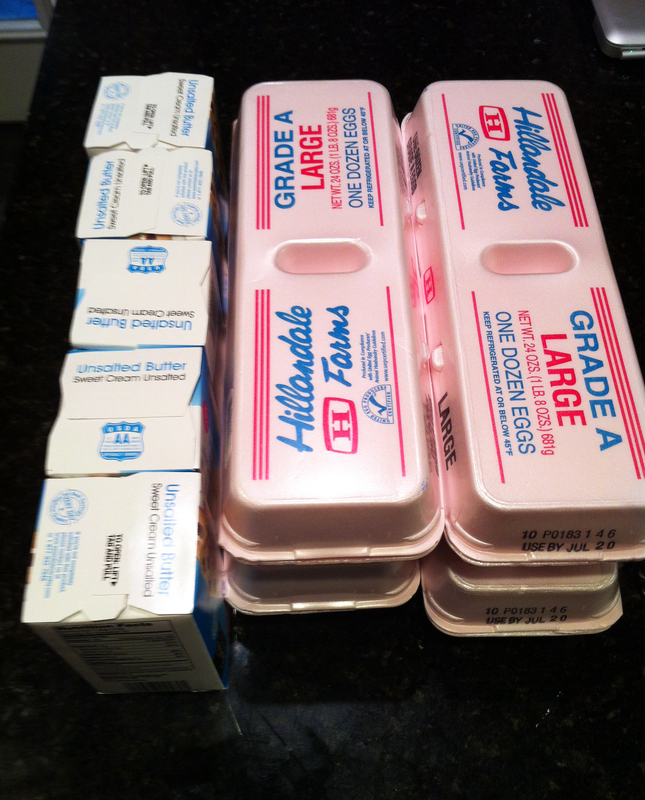 In my house, these are items like unsalted butter, eggs, cheddar cheese, and coffee. Since these foods don’t spoil overnight, I buy up to a month’s worth when I see them on sale. This can add up to deep discounts, like a savings of $1-2 per item. Changes are good that they’ll be back on sale by the time I need to buy them again. Such as easy way to save money at the grocery store! For example, red peppers and green peppers were on sale for $.99/lb last week so I bought 3 of each. (They normally cost $2.99/lb at my local grocery store.) 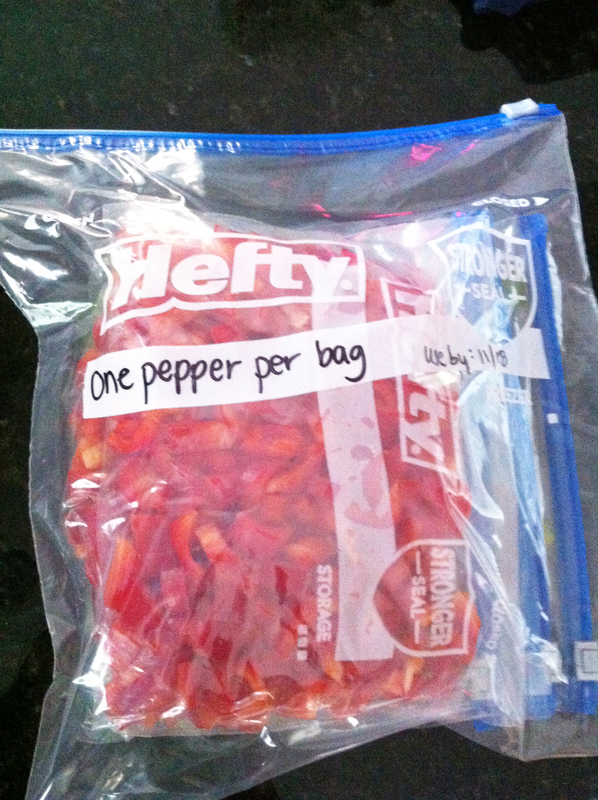 When I got home, I washed, seeded, and chopped the peppers and stored each pepper in its own quart-sized freezer bag. (Because most of my recipes call for one pepper at a time.) Then I organized all of the quart-sized bags into one gallon-sized bag. Not only will you save money, you’ll save time when you’re ready to use the frozen produce because it’s ready to go! Stock up on meat when it goes on sale. 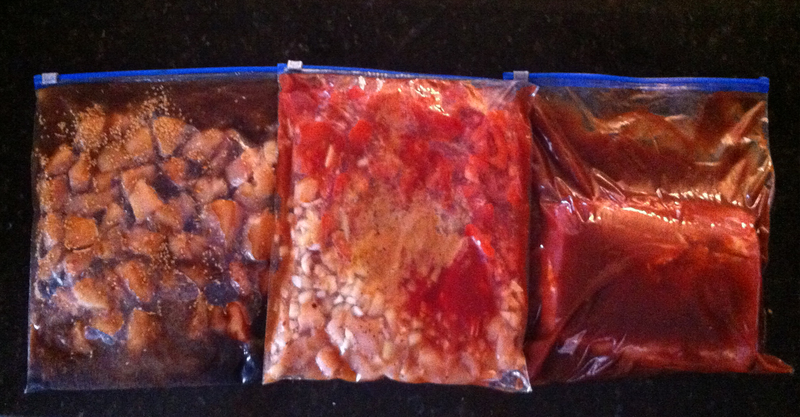 Then, freeze the meat for slow cooker meals. 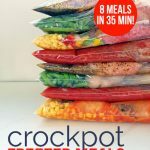 (In a previous blog post, I shared my best freezer-to-slow cooker tips.) 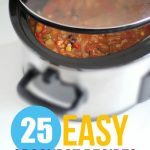 Since the meat cooks in your slow cooker for the first time, it won’t taste like leftovers at all. Since you’re freezing the meat raw, prepping the meals for your freezer is super fast, too. 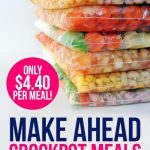 My local grocery store often sells 3 pound packs of chicken breasts for “buy one get one free.” I will use one pack during the week to cook dinner, and split the second pack into freezer meals for my slow cooker. At an average of $5/lb of chicken breasts, that’s a savings of $15! A really easy way to save money at the grocery store is to take advantage of items that you already own. Before planning your next week’s worth of meals, check to see what food you have in your freezer, refrigerator, and pantry. I promise it will take less than 15 minutes and won’t be as painful as you think. Is there meat in your freezer that you can use? 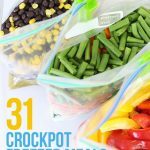 Do you have frozen vegetables in your freezer? What kind of sauces do you have in your refrigerator? 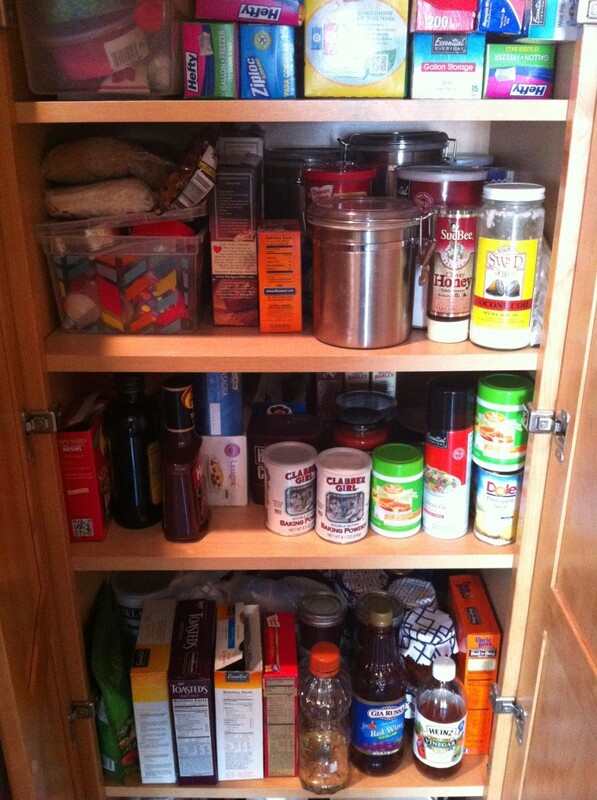 Is there pasta in your pantry that you can use? What kind of canned goods do you have? Then, plan meals that include the food that you find. Look around and get inspired by what you already own. It won’t cost you a penny! Not only will you cut down on the amount of food that you have to buy at the grocery store, you’ll also make sure that you’re using the food that you own before it goes bad. I hope these tips get you thinking about easy ways you can save money at the grocery store. Be sure to follow me on Pinterest @kellymcnelis for more recipes and meal planning tips. See what I’m cooking by following me on Instagram @kellymcnelis. Please share in a comment below: What do you do to save money at the grocery store? Thanks, Laurie! Putting my coupons directly into my purse sounds like a good idea. My husband and I use the app COZI to keep track of things that we need during the week. We also make our grocery lists there. It’s synced between the two of us and we can add our daughters too, when they’re older. So convenient! Bulk items that really save a lot are grains, spices, cereals, dried fruits, coffee. You can even buy these organic in many stores.